The ida and pingala operate on the physical level. Ida corresponds to the flow of breath through the left nostril, and pingala to the flow through the right nostril. These two flows of breath in turn are directly associated with the functioning of the sympathetic and para-sympathetic nervous systems, which regulate and maintain equilibrium of the different functions of the body. They are antagonistic; if one predominates, the other is subordinate. One system tends to conserve energy while the other tends to expend it; one system tends to prepare the body for external action, while the other tends to rest the body and direct energy to internal processes. In general, the sympathetic nervous system speeds up the processes of life, such as the heartbeat, the breathing rate and raises body temperature. The parasympathetic nervous system, on the other hand, slows them down, conserving the body's reserve energy. They function night and day, governing the output of the heart, the blood pressure and the speed at which the body's organs operate. Most of these functions are carried out automatically; because of this, we are rarely aware of the activity of these two vital counterbalancing systems. The flow of breath through the left nostril tends to stimulate all the physical organs and nerves associated with the parasympathetic nervous outflow; the flow of breath through the right nostril stimulates organs and nerves of the sympathetic nervous outflow. This diagram illustrates only the main nerve connections. There are many more, as well as numerous interconnections between the different nerve pathways. If you are interested in looking deeper into this subject, we recommend you consult a textbook on physiology. To clarify the diagram, the following list shows how stimulation of the sympathetic and parasympathetic nerve outflows affect the different organs. The following chart is an oversimplification, but it illustrates that the sympathetic system tends to mobilize the forces of the body for external action while the parasympathetic system tends to mobilize the forces for internal functioning. 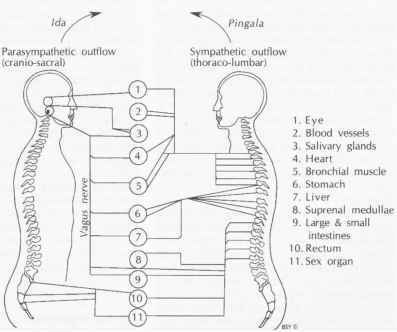 Ida is the parasympathetic outflow; pingala is the sympathetic. in one nostril is usually greater than that in the other. Ifyou like, you can test this for yourself. This predominance also alternates gradually during the day, so that after some time the other nostril will have the greater flow of air. The number of factors is vast. 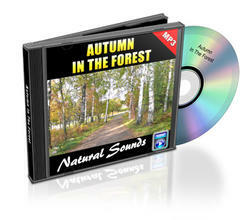 The air will flow spontaneously according to the combined interaction ofthese factors. The study of these factors is called swarayoga (the yoga ofrhythms). The predominance of air flowing in either nostril determines whether the operation of the sympathetic or parasympathetic system is more dominant. There are also times when the flow of air in each nostril is the same. This occurs when this predominance of flow is changing from one nostril to the other. At this time there is perfect balance between the two nervous systems and a condition of physical equanimity. The ida and pingala are balanced at a physical level. But this also leads to a degree of mental and emotional balance in the individual because the mind is intimately related to the physical body. They are part of a total interrelated system. Therefore, balance of the two flows of the ida and pingala in the physical body also implies a tendency towards mental and emotional harmony. This time of perfect balance is the ideal time for meditational practices. In yoga, this balance can be purposely induced through asanas, pranayama and other techniques4. We have briefly described how the ida and pingala function within the physical body. This is only one level of functioning. The ida and pingala are not to be identified only with the sympathetic and parasympathetic systems. The ida and pingala have meanings at other levels as we will now explain.